Le Secret des Sélénites (1983) - Sci-fi-central.com. France  1983  76m   Directed by: Jean Image. 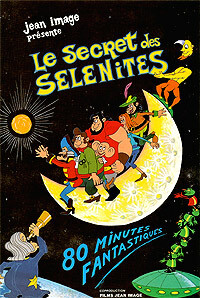  Starring: Dominique Paturel, Pierre Destailles, Serge Nadaud, Jacques Marin, Marc Dudicourt, Georges Atlas, Pierre Mirat, Robert Rollis, Philippe Castelli, Angelo Bardi, Jacques Ciron, Gabriel Jabbour, George Birt.  Music by: Shuki Levy, Haim Saban. Baron Munchausen is informed by an astrologer cousin of his about the Selenites, an extraterrestrial race which is native to the Earth's Moon (''Selene'' in Greek). The Selenites have reportedly discovered the secret to immortality. The Baron organizes an expedition to the Moon, hoping to convince them to share the secret with him. He and his companions arrive just as another alien race invades the Moon, and they are caught up in a war. When I first saw this cartoon, way back in 1983 (I was an adult already), I thought it was a few decades old even though it was actually recently made. It's made in a way that seemed very different than most American cartoons, very hokey and a lot of it seemed unmotivated (like, why do the characters vibrate and twist?). But something kept me from switching it off. And the more I watched it, the more my brain melted, with various lobes turning off until I almost liked it. Now, more than 25 years later, I can't tear my eyes away from it, and I even forced my (grown) daughter to watch it so that she, too, could be subtly altered by it (I think it knocks your IQ down for good). But something always bothered me about the catchy theme song, and now it has come to me: its refrain is awfully reminiscent of the refrain to Helen Reddy's 1975 "Emotion". Review by kyle-664-303738 from the Internet Movie Database.